Glass rooflights can be specified with a laminated glass load bearing outer pane, to provide ‘walk-on’ capability. This type of rooflight is becoming popular within residential and commercial markets. 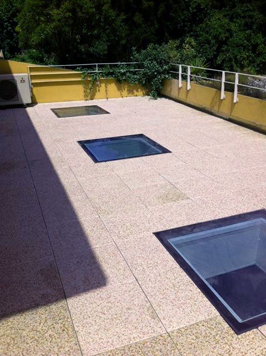 Walk-on glass rooflights provide an unusual feature and can bring natural light to rooms beneath roof terrace areas and basement rooms. They are also utilsed to allow naturally light to travel between multiple floors. As a premium product typically for ‘high end’ applications, walk-on rooflights are generally custom made to order. The required glass thickness and weight for walk-on rooflights increases exponentially with size. Larger glass unit rooflight/floor applications will require suitable lifting equipment to manoeuvre the glass directly into location. Typical glass walk on skylights and floors contain intermediate rafters at approx. 1,000mm to 1,500mm centres. Options include anti-slip, tinted and etched glasses.